SECCA & Shinique need your pillows, blankets & stuffed animals! Do you ever wonder why you keep some things and discard the rest? That question is one that artist Shinique Smith explores intimately with her artwork. The Southeastern Center for Contemporary Art (SECCA) will be presenting an exhibition by Smith opening on Nov. 18th. For the exhibition, titled Every Brick, Smith will be creating new works in SECCA’s Main Gallery. To do this, she needs help from YOU! 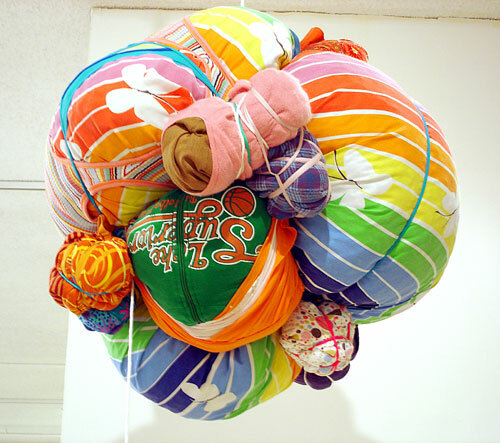 Smith is collecting donations of the following items for use in her new sculptures: throw pillows (any color, any shape), decorative blankets (any kind), stuffed animals (any size) and spare change (pennies are perfect). Donations of throw pillows, blankets, stuffed animals and spare change can be dropped off at SECCA any time the gallery is open to the public: Tuesday – Saturday, 10 a.m. – 5 p.m., Thursday, 10 a.m. – 8 p.m.; Sunday, 1- 5 p.m. SECCA is officially closed Mondays, but staff will be in the office to accept your donation. All donations are 100 per cent tax deductible, and donors will receive a tax receipt. SECCA requests donations to be dropped off no later than Nov. 13. If more items are donated than are needed for Smith’s artwork, all extra materials will be donated to Goodwill Industries of Northwest North Carolina so that SECCA has the opportunity to give back to the community that helps build this project. It’s important to note that Smith’s installations grow from her ongoing collection of found materials, which she translates into sculptural forms that reflects her surroundings. She sees clothes, pillows, blankets and personal belongings as vessels of history related to the identity of their owners — reflecting values, tastes, beliefs and belongings. Using spare change in the artwork will be a similar reflection of fragments of value — something that by itself is regarded as having little value; but in a collection/community, accumulates value.